Ahhh Springtime. 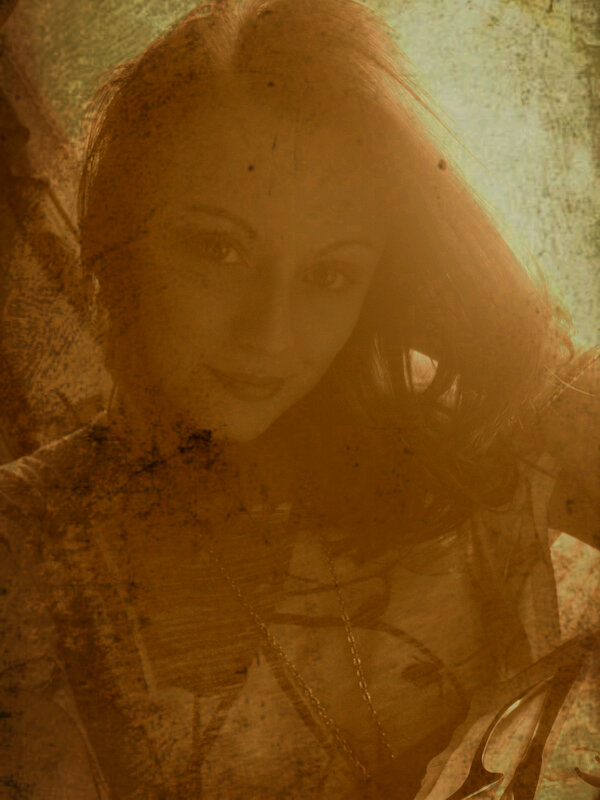 So close to summer. 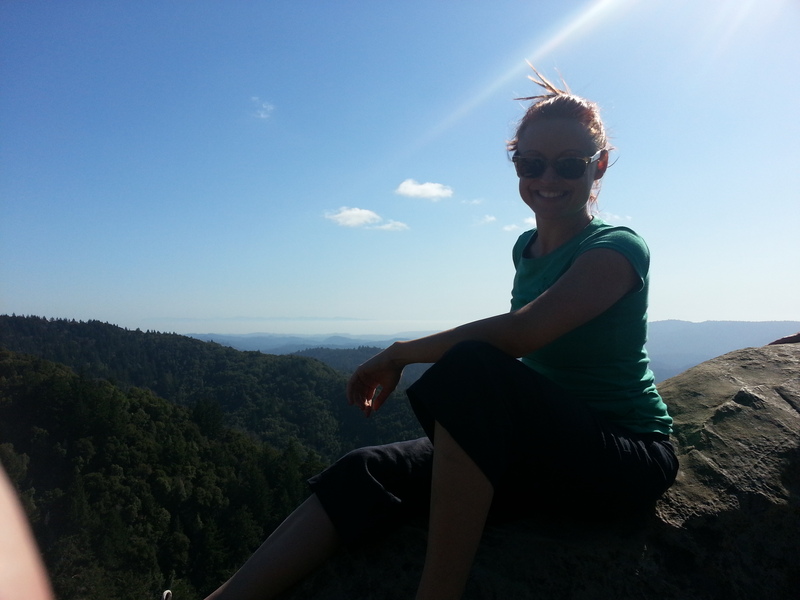 Time for lost clothing, shorts, hikes, and camping. It’s also that time of year for beachy, flowy hair. One thing that just makes me laugh is when people buy “Beach Spray” for their hair. Don’t be fooled! You’re buying salt water (with perhaps, a little hair spray) in a bottle – this is a very sneaky scheme. It’s easy to get scammed into buying that beautiful bottle of stuff that promises to make you look like you just returned from the beach. Well, I have a surprise for you!!! You can make your own for pennies on the dollar. Simply dissolve a teaspoon or two of salt into some warm water, add a little hairspray if you choose, shake, spray! Yes, that easy. For me, I have stick-straight hair. I spray this on my dry hair and scrunch it up with my hands until the spray dries. It gives my hair a little more texture than it normally has. The more natural texture you have, the more wave you will see. Be careful though, the salt will dry out your hair. Be sure to properly moisturize your hair so you don’t damage your hair. Just because it is a natural product, does not mean that it will not damage your hair. Have you ever made your own beach mist or hairspray? What have your results been? What kind of recipe did you use? I bought a bunch of sprouting seeds from mountainrosehers.com and didn’t really know what to do with them. I tried sprouting them in a tea cup … and it worked but not 100% … luckily I stumbled upon this instructional video from mountainroseherbs.com that showed me some better ways to sprout my alfalfa and chia seeds. I tried the sprout in a jar thing. I didn’t have the mesh screen top so I just put some tin foil on it and poked a bunch of tiny holes with a toothpick. In about a week I had a jar brimming with alfalfa sprouts. I was quite impressed with this technique. However, I think I used too many seeds … so I cut it back to 5 teaspoons of alfalfa seeds this time. Check it out! We used our sprouts for juicing. Until next time, I send you peace love, and good energy. Getting back to basics can be the best way to take care of ourselves inside and out. I’m always looking for natural ways to take care of my skin and avoid the processed and chemical laden store-bought products. This recipe is a great way to refresh your skin by sloughing off dry skin to reveal and fresh and dewy face. This product leaves skin smooth, soft, and very hydrated. Because this scrub can be a bit runny and sticky, don a shower cap or wrap your hair in a towel before use. In a small bowl, combine the ingredients thoroughly and allow cornmeal to absorb the liquid for 1 minute. Using your fingers, gently massage onto the face and throat, lie back, and leave on for 15 minutes. Rise with warm water to revel your new dewy skin. While I was impressed with this crispy delights, I was not impressed with the price tag of nearly $8 per 2.5 ounce box. So, I did what any modern urban hippie girl does … she makes her own. Now, this was my first stab at it. 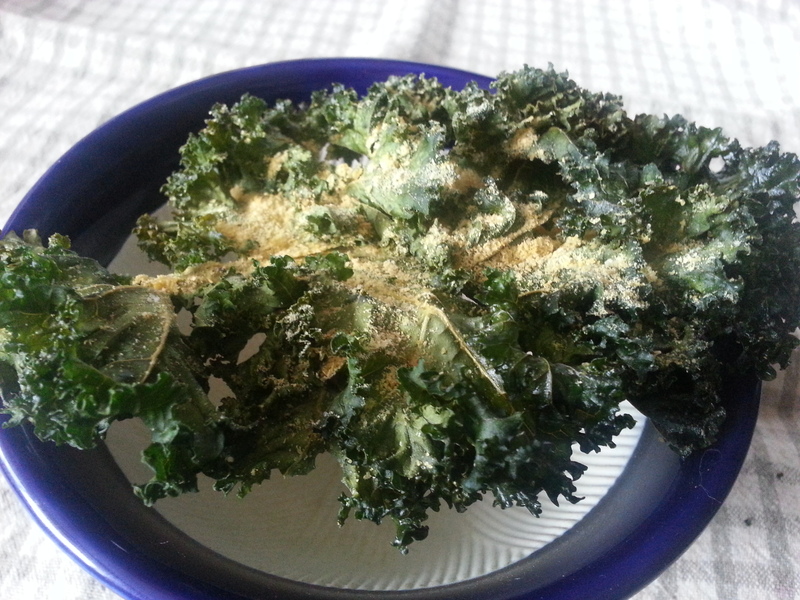 I’m sure I could improve the recipe, finagle with with type of kale leaf, change up the spice blend, but I have to say … I am pleased with my first batch, and have been happily munching on my green crisps ever since. 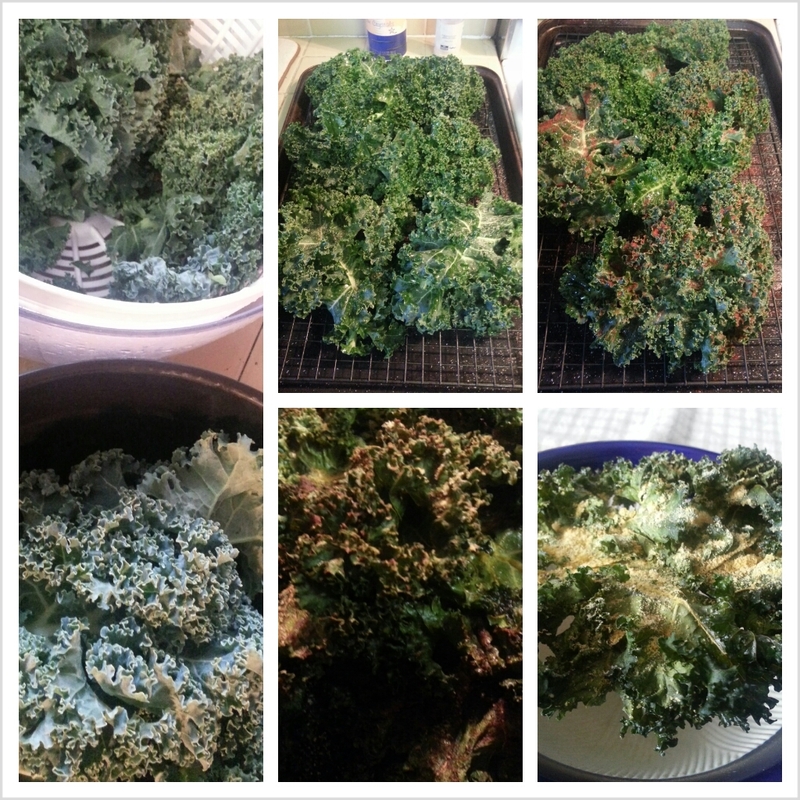 Wash kale leave thoroughly. Trim off large stems/ends. Dry leaves as best you can. I left my leaves whole since I have a very curly kale to work with. But you could tear the leaves into more bite sized-pieces. Put kale into a large bowl and drizzle with a bit of olive oil. 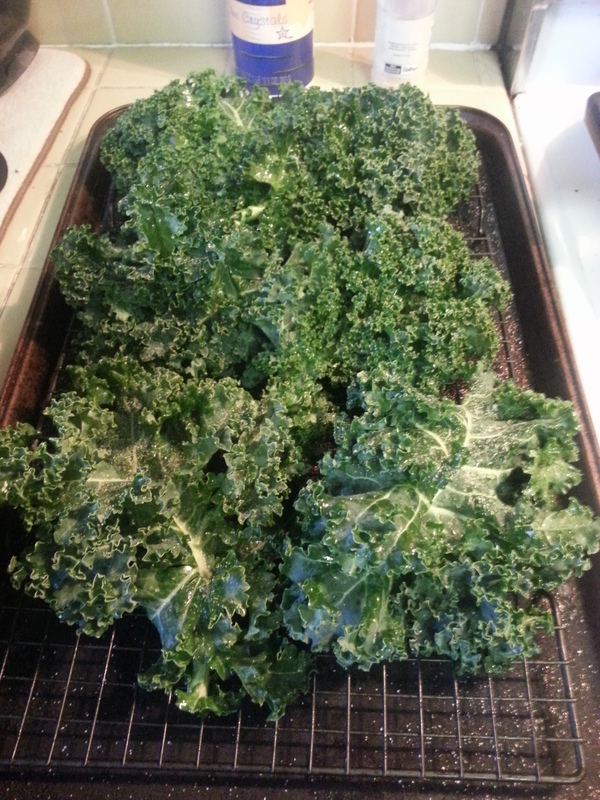 It does not take a lot of oil to give the kale a good coating. Lay your leaves out in a single layer on the cooling racks. Sprinkle with desired spices. I did two difference versions: 1. salt, pepper, nooch 2. salt, pepper, garlic powder, smoked paprika, tiny bit-o-nooch. Put the racks of kale into the oven for 2-3 hours. I think about 2.5 hours was the best for my chips … just keep an eye on them. You can check for done-ness by sampling a small edge. You want them crisp, but not too crisp. I will have to say – both flavors are phenomenal, and you can come up with a million more flavor combinations. This is something that you can easily make while you’re studying, cleaning the house, or just relaxing for the evening. If you’ve ever had en experience with kale chips, please comment below. Did you like them/not like them? Have you ever made them yourself? Let me know – I would love to hear your experiences. Aloe Vera juice makes a great all-over gentle toner. Contrary to popular belief, it’s a bit drying if used routinely and is thus most effective for oily, combination, and normal skins in need of calming treatment and gentle handling. Aloe is extremely soothing and healing when used to relieve environmental irritations and the itch from insect bites. Note: Aloe vera may irritate very sensitive or dry, dehydrated, sunburned, or windburned skin. You can lessen the irritating effects and still benefit for its healing properties by diluting the juice or gel 50% with distilled water. Store the mixture in a small jar in the refrigerator and shake vigorously before each application. Pure aloe vera juice or gel, commercially bottled or fresh-picked leaf. Store in: refrigerator in original container or store cut leaf in a plastic bag. If using commercial juice or gel, follow label directions regarding storage; it almost always requires refrigeration. If using the gel from a leaf or your own alow plant, cut off the amount you are going to immediately need and store the remainder of the leaf in a plastic bag in the refrigerator. It will keep for about three days. Application tips: Simply soak a cotton pad with the juice or gel and apply to skin as desired. This is a delicious, sweet way to soften, deeply hydrate, and moisture your skin. This treatment leaves skin with a rosy glow resulting from increased circulation. Application tips: Honey thins and get runnier as it warms to skin temperature, so be sure to wear a shower cap or pull your hair off your face and neck prior to application. 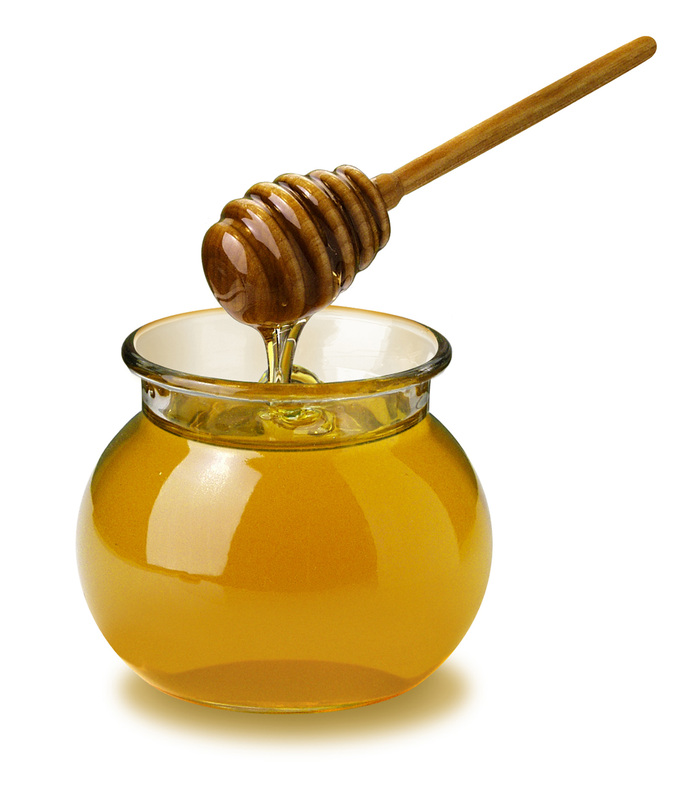 Using your fingers, apply a very thin coat of honey to your entire face and neck. 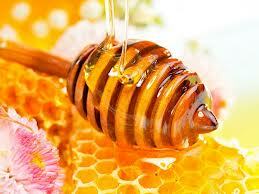 When the honey is spread evenly, it will bead on your skin much like water beads on your car after a rain shower. Leave on for 15 minutes or longer while you relax. Before rinsing, for about 5 minutes, begin to pat your skin lightly with your fingertips in quick tapping motions, as though you are playing the piano. Rinse using a very warm, damp cloth. I hope you enjoy this recipe from the new body care book I recently purchased. I can’t wait to try out more recipes and share them with you. Until next time, I send you peace love and good energy. Due to a recent incident on my birthday, in which my car was broken into … and my very special friendship necklace was stolen … I found myself at the local bead shop perusing for an infinity charm to make some bracelets. Unfortunately, they did not have what I was looking for … but they did have some other beads I liked. So, $33 later I ended up at home with some waxed cotton string, a couple of strings of beads, a few jump rings, and clasps. 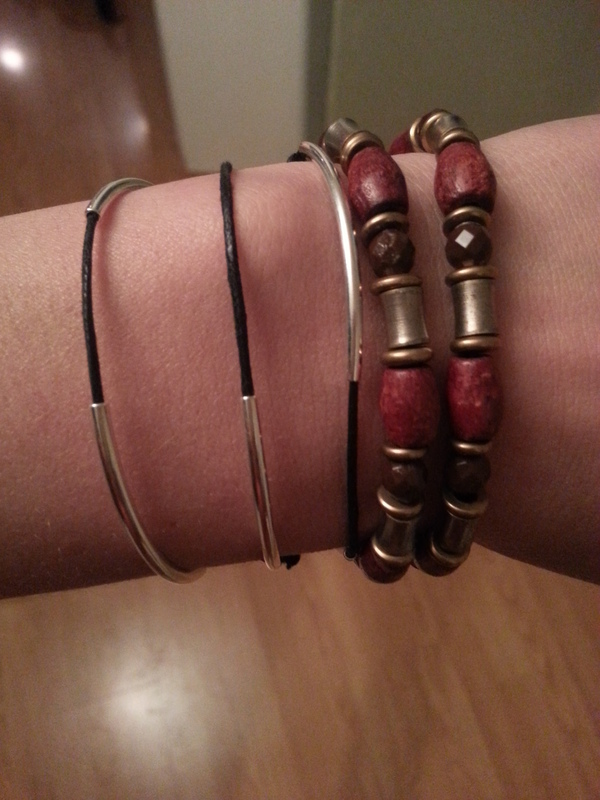 Being a Pinterest junkie, I have seen a ton of super cute DIY bracelet and jewelry ideas that I just had to try. Also, I should mention that I have a giant bowl on my dresser full of bracelets, cuffs and other old jewelry I have collected over the years. Soooo – I decided to raid my bowl for bracelets I don’t wear any longer to see which ones I could cut up and make into something new (because beads are expensive!). 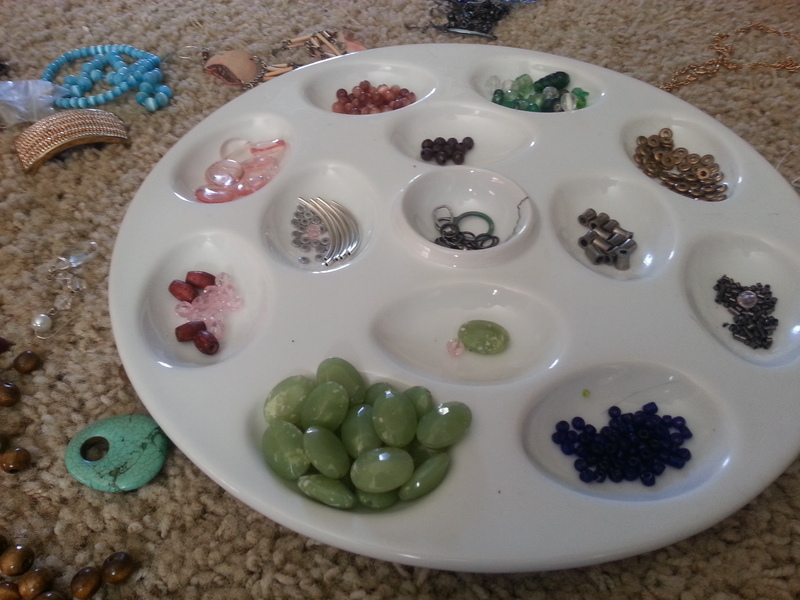 And then, my living room started to look like this: Yes, that is my deviled-egg dish being re-purposed as a bead sorter. The point of this post was not to show off killer crafty skillz … it was to get you thinking. 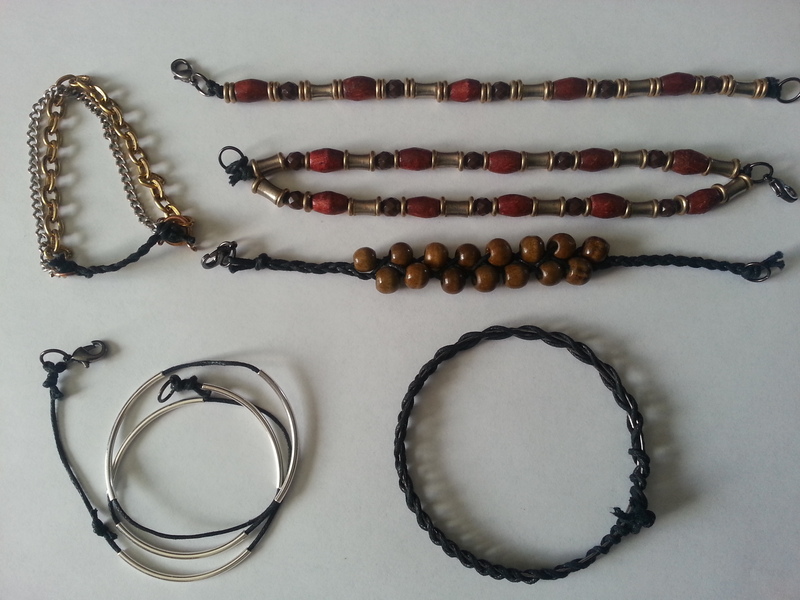 It’s not just about making friendship bracelets from other stuff … it’s about recycling the old and making it into the new. Check out my Pinterest page to get some ideas about up-cycling your old things into new fun things that you will love! How do you recycle and reuse in your house? Dry shampoo has been all the rage in the trendy beauty industry. Unfortunately, these products are sold in aerosol cans and/or full of harmful ingredients. Basically, dry shampoo is a substance that absorbs the oil at the roots so you can leave the house without looking like a greasy mess when you don’t have time to shower. I was a huge fan of the popular brands until I learned what I was spraying on my head. I thought baby powder would be a good alternative until I realized talc was a carcinogen (and why are we putting this on our babies???!). I began searching for a natural alternative for when I’m having one of “those” days or when I simply feel like giving my hair a break from washing. I live in the desert so if I wash my hair too frequently it gets all dry and frizzy – so dry shampoo is my friend. It should also be explained that the oil that your head produces is good for your hair – it is our bodies way of naturally conditioning our hair. It is commonly used in cooking as a thickening agent … but is has many other uses that you can read on mountainroseherbs.com. I also buy my arrowroot powder from Moutain Rose Herbs – they have great quality products for great prices. Put the arrowroot powder into the container. Note: This is to be used at the roots of your hair. I only use this on the top of my head. I start from a part above my ears and work from one side to the other. Make a part. Dip the brush into the powder, shake off excess, and then dab the powder onto your roots. 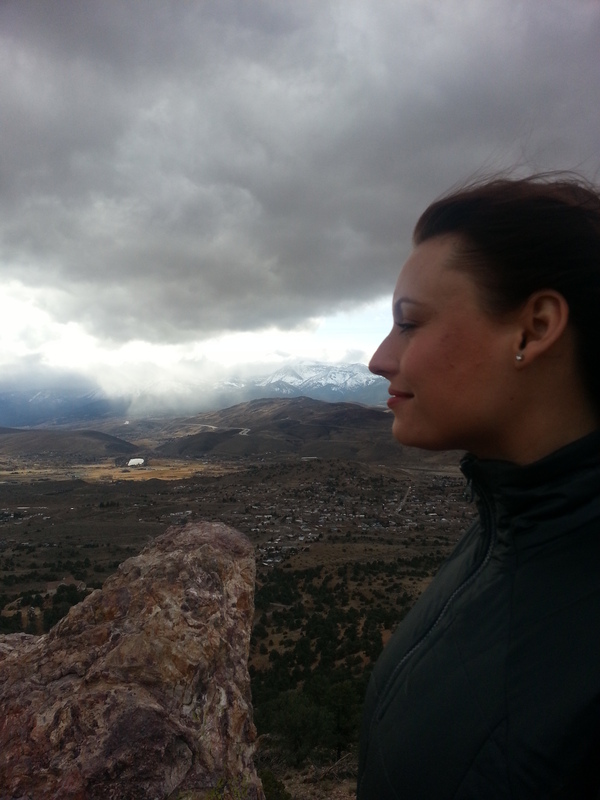 If you have dark hair like me, don’t be alarmed at the excess white powder – it will go away. Keep making parts about 1/4 to 1/2 inch apart and work over the top of your head to the other side. Concentrate on the most visible parts. Then, take your fingers and massage your roots. The powder should not be visible at the point. If it is, you can run your brush through to get the excess out. Your hair should be looking pretty darn good. I will say – it doesn’t have that freshly washed look – but it does help tremendously and it will get you through the day. Have you ever used arrowroot powder? What for? Assemble your blender. Add cashews, water, and blend on high for 2 minutes. Bam! Cashew milk … not kidding you. This beauty will replace any milk or non-dairy milk. I use it to make oatmeal, my egg-less french toast, to dip cookies in, and anything else you like milk in. It has a light flavor and the taste of the cashew is nearly gone, but yet has a subtle richness. Try it out – you won’t be disappointed. I made some cashew milk for hot cocoa the other night … it was a hit … everyone loved it. So, I challenge you to take out your blender, make some cashew milk, and tell me what you think! I would love to hear your thoughts on this.